20% discount on all food ordered at lunch or dinner (min spend of £20 applies) throughout Restaurant week. We are also offering a room to anyone who wants to stay over after dinner at only £40.00 for two B&B. Claim this offer at the bottom of the page! Monday 12 noon - 3pm and 6.30pm - 9pm. Tuesday 12 noon - 3pm and 6.30pm - 9pm. Wednesday 12 noon - 3pm and 6.30pm - 9pm. Thursday 12 noon - 3pm and 6.30pm - 9pm. Friday 12 noon - 3pm and 6.30pm - 9pm. Saturday 12 noon - 3pm and 6.30pm - 9pm. Sunday 12 noon - 3pm and 6.30pm - 9pm. 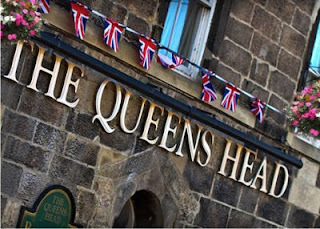 The Queen's Head is noted for its modern and traditional British menu. Using locally sourced produce and ingredients where possible, our chefs produce consistently excellent pub food at its best! The Restaurant - The comfortable ground floor restaurant has a lovely dark polished wooden floor, dark wood tables and high backed leather upholstered chairs, complemented by a light, airy colour scheme and friendly helpful staff the overall effect is a laid back relaxed atmosphere where you can linger over a coffee or after dinner drinks. Breakfast is served in the homely first floor dining room for residents only. The Bar - If you prefer you can eat in the bar. A warm and friendly atmosphere and well kept cask marque real ales await you in this very popular beamed room. Next door (but far enough away so you can't hear it) you will find the games room with pool table and juke box.